One weekend in Mysore we took a train to Hospet to visit Hampi which is an ancient archaeological site. 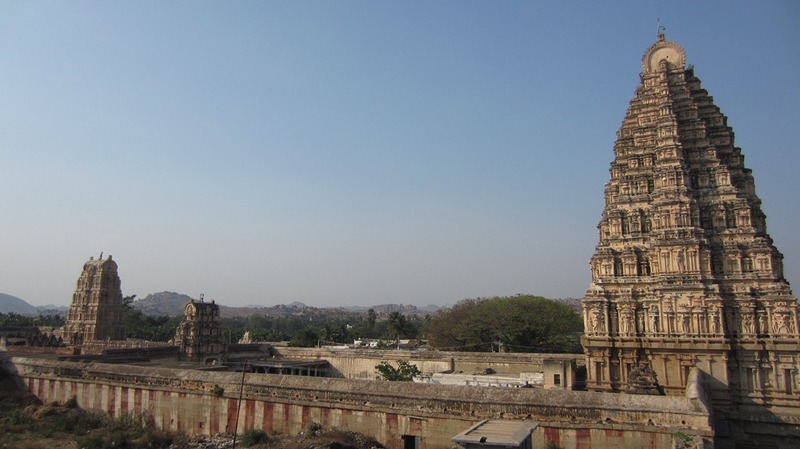 Hampi was the capitol of all of south India from about 1331 to 1545 when the Muslims overtook the South. It is a perfect blend of both South and North Indian architecture which is called the Vesara style (vesara literally translates to “mule”, or mix of two things). It was run by the Hoysala Empire for that 200 year period. The city itself is now in ruins and you can spend hours just walking around the different sites and temples. 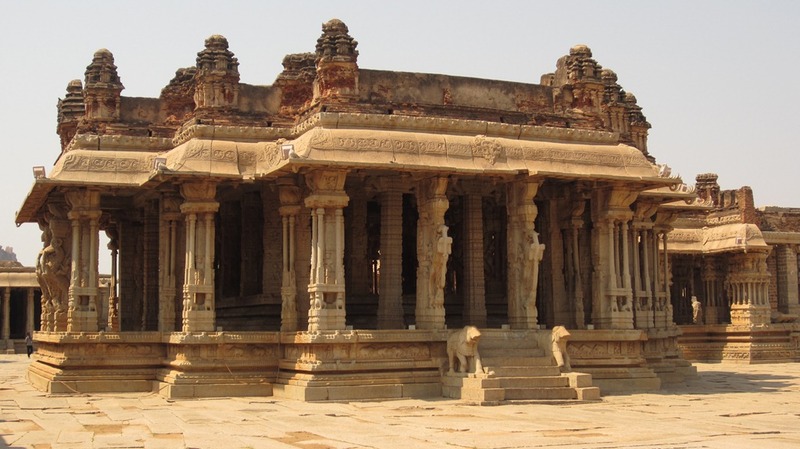 Hampi is known as the “temple city” because it has over 300 temples – which are all intricately carved and assembled. Hampi is India’s largest heritage site and is now a UNESCO world heritage site – which has its pros and cons. The first day we spent touring around the main ruins and visiting the main temples and palaces – it was all so amazing. It was incredibly hot and tiring but I was super thankful to have studied Hampi architecture in class the week before. I felt like I had some idea of what we were looking at and learning about. 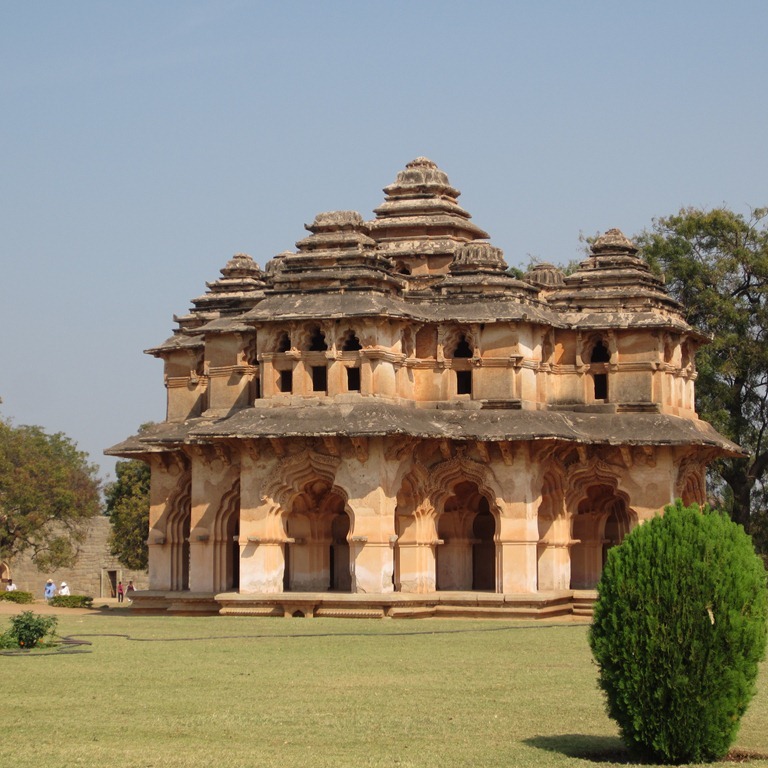 The step/pyramidal style of temples is an example of S. Indian architecture called the dravidian style – it had a lot of flat roofs and intricate carvings adorning the outside. 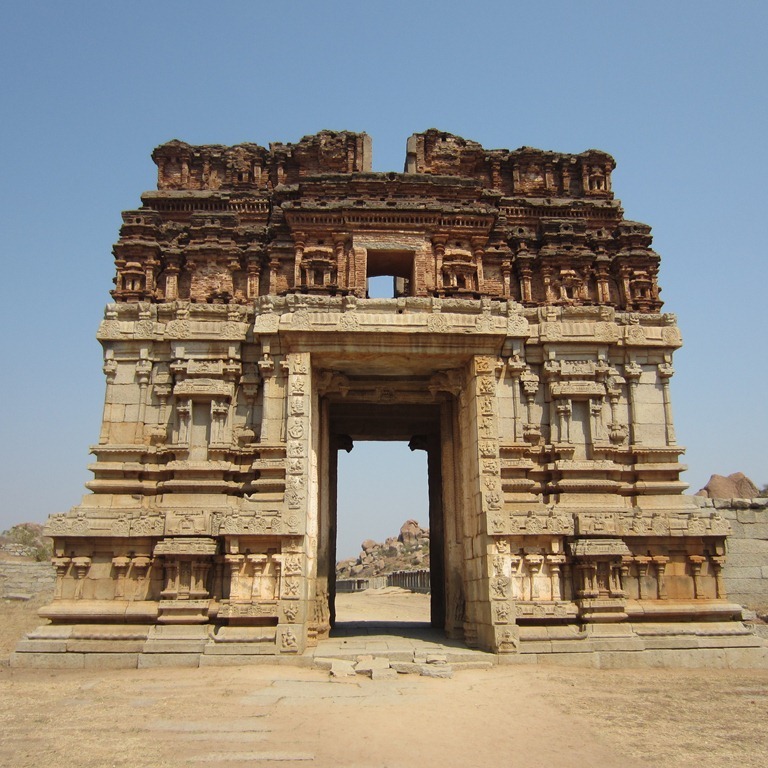 North Indian architecture was also at Hampi and instead of being flat and pyramidal in shape with intricate decoration it is more dome-like and incorporated true arches. 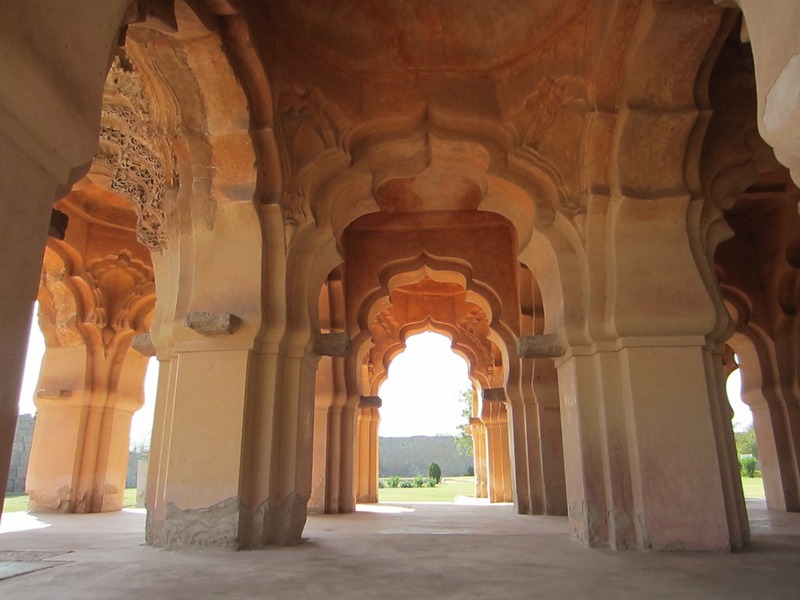 The N. Indian architecture is Islamic influenced mostly because N. India was constantly being invaded and controlled by Islamic forces (ie the Mughal Empire). We were able to visit the Queen’s Palace and a particular building called the Lotus Mahal. In the pictures below can you see the N. Indian influences of the carved doorways? It is also mixed with a step/pyramidal roof. This is a great example of Vesara architecture – a mix of both Indian and Islamic styles. That night I spent some time studying because that was the weekend right before our week of exams! haha. It was an interesting time to go away for the weekend to an awesome place. The next day we had the morning and early afternoon to keep exploring around so we rented bikes and biked around all day. I was too nervous to ride one myself – I’m not very experienced with motorcycles! But I rode on the back of one and had one of the boys drive it for me. Which actually worked out perfectly because I was able to take tons of photos of our little bike gang. All the locals thought it was hilarious that we were all riding motorcycles but it was a complete blast. We were able to see ruins and drive past the most beautiful rice paddies. 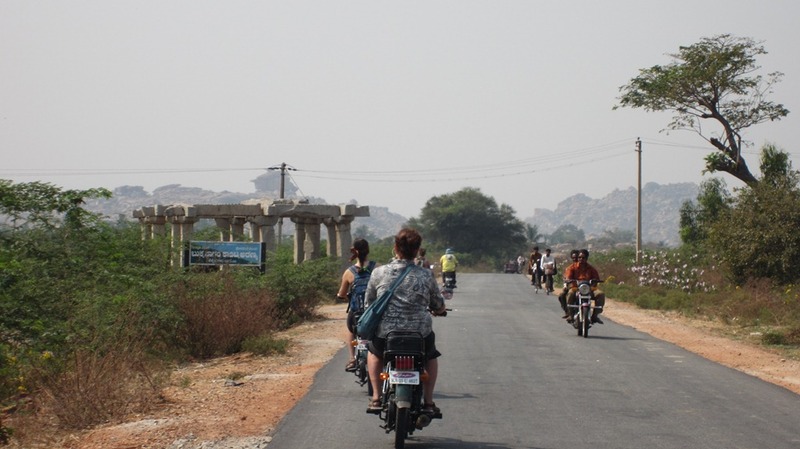 For some bizarre geological reason Hampi is filled with giant mountains made of boulders. And no one seems to know how they arranged themselves the way they did – but they are fascinating to drive by. This is a photo of my awesome professor: Chris Hall. 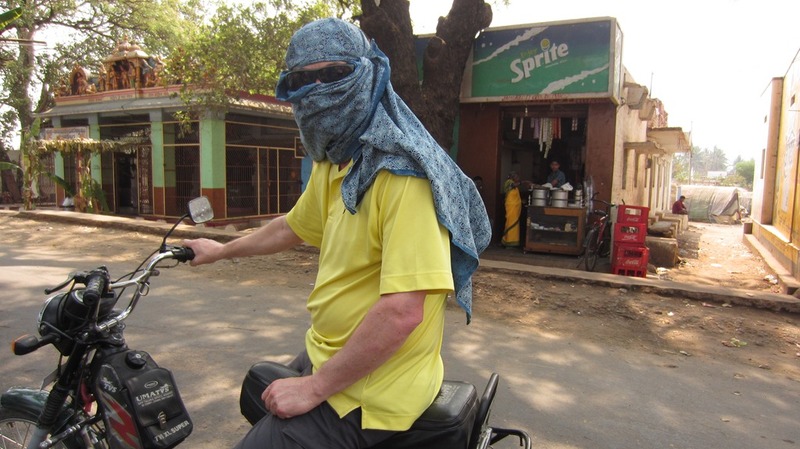 We lost his Tilly Hat on a bus but luckily he has this North Indian head wrap to protect his scalp from the blazing sun! Doesn’t he look stellar? The sun and the heat that weekend wiped me out a little bit, but it was definitely worth it. Hampi was an amazing place to visit. As it is now a UNESCO World Heritage site all the townspeople that have lived in their little community for generations are being forced to move. I had the last chance possible to stay right in the city. It’s really unfortunate because about 300 people have to uproot their families homes, shops and livelihoods. The Government has bought a plot of land 3 km away for them to live on – this may sound reasonable but there is no tourist market there and the land is a former burial ground which the people are very superstitious about. There may be some reimbursement for a select few, but even that will be very meagre. The effort of conserving a historic site is very noteworthy and supported internationally. But often we forget about the people who have lived near those sites for generations and are forced to relocate. I feel like this is an example of bad development in which my children’s generation will be learning about in a case study when they are my age. I was incredibly blessed to visit Hampi when I did – and I know that if I return in 20 years it will be a completely different place.